About 10 months ago, I pinned this recipe to my Pinterest board. It looked yummy so I decided to make it for New Year's Eve. It was delicious! I'll definitely make this again sometime. One thing I'll do differently though, is add a little less salt. The cheese is already salty, so the asparagus doesn't need much salt added to it. Preheat oven to 400 degrees. On a floured surface, roll the puff pastry into a 16-by-10-inch rectangle. Trim uneven edges. Place pastry on a baking sheet lined with parchment. With a sharp knife, lightly score pastry dough 1 inch in from the edges to mark a rectangle. Using a fork, pierce dough inside the markings at 1/2-inch intervals. Bake until golden, about 15 minutes. NOTE: Thaw puff pastry according to package instructions. Emmentaler or Fontina cheese can be substituted for the Gruyere. After the 1st bake, let the puff pastry cool a little, that'll allow it to fall if it has puffed up. I gently helped it down by pushing on the top of the tart oh so very carefully, so as not to break the tart. But I mostly let it fall by itself. It may not have puffed as much if I had made my folk piercings deeper. I didn't bother trimming uneven edges. It seemed even enough to me after rolling it out. 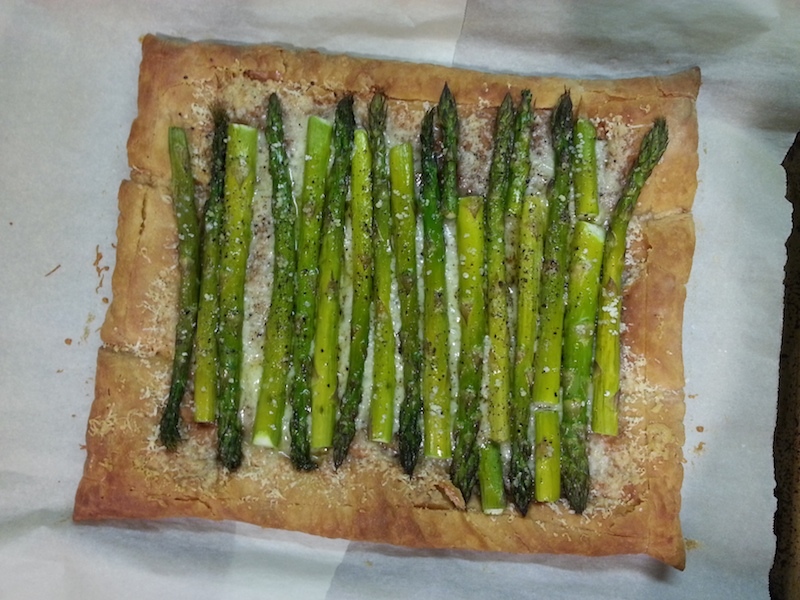 I have made a very similar recipe using Boursin herb and garlic goat cheese, asparagus and some gouda cheese. Really yummy! But I think I should slightly cook the asparagus first, some of the stems got rather stringy. It's SO YUMMY!